NFL Ultimate Franchise Player Tourney field unveiled!! With my 32-team Ultimate Franchise Player series now finally over, it is now time for the hard-core bracketology. 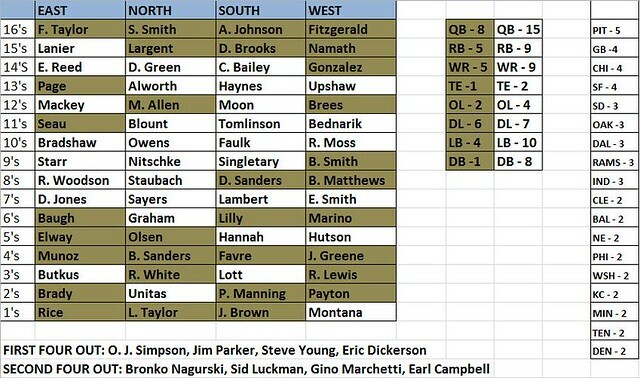 After much deliberation and shuffling, here is my final 64-player field – including my 32 at-large selections..
For an explanation of Kurt Allen’s methodology for choosing each franchise’s ultimate franchise player, and then how you and he will choose the NFL’s Ultimate Franchise Player from that list, click here. Time for some explanations. Players listed in gold earned the automatic bids as their franchise’s All-Time Ultimate Franchise Players – those listed in white are the at-large entrants. To the right of my grid, you can see the distribution by position, first among the automatic selections, and then overall. To the right of that you see the 18 franchises who have multiple selections in the field, those not listed are the teams with one player each in the field. With only 64 spots, it takes much more than a yellow jacket from Canton to make the cut, especially as an at-large entrant. Even if I were to expand the field to 128 I would still be leaving a lot of all-time greats out. As an at-large, it would take an RPI number of about 50 or lower to realistically make the list. As is the case with the NCAA Tournament, the 15th and 16th seeds comprise of players who would not be on the list if they had not been given the crown as their team’s UFP. Three of the 15 seeds would rank as borderline top-100 players, while the 16s are ranked between 230 and 300 per Pro Football Reference. As might be expected, quarterbacks have by far the greatest representation. They comprise nearly 25 percent of the field, got eight of the automatic bids and there are 15 players from the position overall. Nineteen of the overall bids and 35 total players come from skill positions. In all, 39 players are on offense, 25 come from the defensive side of the ball. Only one defensive back was selected out of my original 32 team UFP bids. I tried to make up for that with seven at-large selections out of the secondary. Forty-seven players in the field are already enshrined in the Pro Football Hall of Fame. Ten players in the field remain active at this moment – a list that include No. 2 seeds Peyton Manning and Tom Brady, No. 10 seed Randy Moss, No. 12 seed Drew Brees, and No. 14 seeds Tony Gonzalez, Ed Reed, and Champ Bailey. The Hall of Fame chances of even the three 14s are very favorable. The remaining seven recently retired and in most cases will not be waiting long to get the call from the Hall. Derrick Brooks becomes eligible in 2014, Junior Seau in 2015, Brett Favre and Terrell Owens (barring a comeback attempt) would be eligible in 2016, LaDainian Tomlinson in 2017, Ray Lewis in 2018. Not surprisingly, the only four not ensured of enshrinement in Canton are our 16 seeds. Per the current Pro Football Reference Fan rankings, Larry Fitzgerald currently sits at No. 217, Andre Johnson No. 231 and Steve Smith is at No. 277. In recent days Fitzgerald and Johnson have been trending upward in those rankings, while Steve Smith has been falling. If any of the three were to retire now they would be firmly on the Hall bubble, but with the entire body of work not complete, there is still time for the three wideouts to enhance their credentials. Years from now, the 64th player in the field may end up as the lone player not in the Hall – Fred Taylor is already in the clubhouse and his Pro Football Refrerence RPI is sitting at No. 278. As of now Taylor is on the dark side of questionable, and his best chance of getting a Hall pass may be with the veterans’ committee far off in the future. The premise of seeding this field is similar to what you see in March Madness. Some players are over-seeded or under-seeded. One of my first criteria was to make sure two players from the same position do not face off in the first round. I just feel players from different positions, and different eras, makes the process more entertaining. Looking at each of the 32 franchises as its own “conference,” I decided on a cap of four players for each team – but I did make an exception in regards to the Steelers, from whom I tapped five players. For those teams with multiple representatives, I spread them out amongst different regionals. So with the exception of two Steelers possibly meeting in the Elite Eight, a matchup between icons from the same club cannot happen until the Final Four. I also like the fact that I was able to get multiple representatives out of 18 teams. Willie Lanier, Ed Reed, Champ Bailey, and Darrell Green were my last four in, giving each of their teams two representatives. I was particularly happy that I was able to get two Broncos and two Chiefs into the field. Shockingly, the New York Giants only have No. 1 seed Lawrence Taylor in the field. That was a no-brainer. While LT is ranked third on the NFL Top 100 list, the next Giants on that list are Emlen Tunnell at No. 79, Sam Huff at No. 93, Mel Hein at No. 96, and Michael Strahan at No. 99. To be honest, Haynes’ career is so split equally between the Patriots and Raiders that you could have him representing either, or just consider the Raiders and Pats as having two-and-a-half players each. On my first four, and second four, who fell just short of making the illustrious field, O.J. Simpson remains the elephant in the room. For the rest of my selections, off-field escapades did not factor into the equation. In fact, that is what I like about the Pro Football Hall of Fame, those deserving of entrance are considering on talent alone. That stands in contrast to the Baseball Hall of Fame at Cooperstown, where the baseball writers pretend that guys like Pete Rose, Shoeless Joe Jackson never existed for various reasons. In actuality, Simpson is probably a No. 9 or No. 10 seed. Is his body of work better than Willie Lanier or Champ Bailey? Probably. I remember Juice tearing it up in the middle of the 1970s like few backs since. But my final decision was to leave him out of the field. You could argue that I am starting a slippery slope here, that perhaps I should also omit Ray Lewis. Well, my slope stops with Simpson. Lewis is a top-15 all-time player in my opinion and the evidence in the court of public opinion with Ray is not as damning as it is with Simpson. Jim Parker and Gino Marchetti – I am guilty of omitting a lot of the old-timers from the field of 64. I gave Sammy Baugh and Don Hutson their due from the 1940s. NFL Films in fact declared Hutson as the best Green Bay Packer of all time, which was done just to spark argument. Hutson’s total body of work does not nearly compare with Brett Favre’s. I also have Otto Graham, Jim Brown and Chuck Bednarik out the 1950s. On the NFL All-Time Top 100 list, Parker is No. 32 while Marchetti checks in at No. 39. Both are very deserving, unfortunately, a lot of greats had to be left out and I kind of treated the old-timers like the NCAA treats mid-majors who did not win their conference tournament. I also decided three Colts were enough in the field. Steve Young – No one is as big a fan of Steve Young as myself. Two factors work against him however: I was pretty well capped with four Niners in the field (Montana, Rice, Lott and Owens), and also Young’s No. 81 RPI (according to the NFL Top 100) is a little too low. 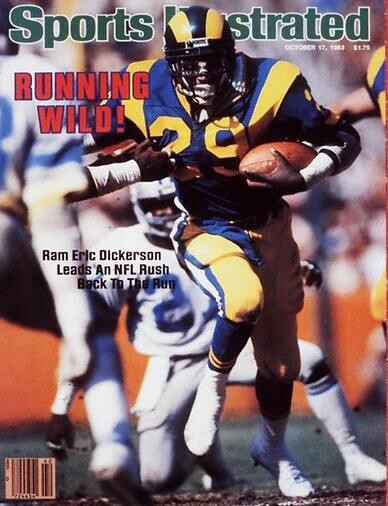 Eric Dickerson – This was the toughest omission of all. Dickerson is No. 52 on the NFL Top 100, while Willie Lanier (my last at-large to make it) is ranked 53rd. Dickerson is also far more popular with the fans, ranked 28th in the NFL’s fan vote and currently 35th on Pro Football Reference. The reason for picking Lanier over Dickerson is as follows: Willie was absolutely stellar as a Pro Bowl linebacker eight consecutive seasons. Dickerson had some historic years early on (leading the league in yards from scrimmage four times), but he faded somewhat second half in his career, and only made the Pro Bowl five times. I also considered Dickerson over defensive backs Ed Reed, Darrell Green and Champ Bailey. In the end I couldn’t put him in over any of the three. Bailey is an 11-time Pro Bowler, Reed has made the Pro Bowl nine times in the last decade, and I can’t go against Darrell Green’s 20-year resume. Eric Dickerson is my unfortunate first player out. Bronko Nagurski and Sid Luckman – I decided against putting a fifth Bear or Packer in the field. I would like to focus on Nagurski, who at No. 19 is the highest ranking omission off the NFL Top 100 list. I’m sure he dominated the 1930s – there just is not a lot of video evidence from that time period. Furthermore, how would Nagurski compare with a lot of the greats of the past two or three generations? He was a legendary athlete by all accounts, I’m just not convinced he is good enough to make this field as an at-large. Same goes with Jim Thorpe, who ranked 37th in the NFL countdown. He is certainly on the short list as among the best athletes from the last 120 years or so, but as a pro football player his career basically consisted of barnstorming with a number of teams when the NFL was in it’s infancy. He is one of the pioneers of the game but he came so long ago that he didn’t get to complete against on a weekly basis during his career. Red Grange (48th on NFL list) is also in the same boat, he made an impact barnstorming when he turned pro after his college career ended, but did not have an extended career in the league. Earl Campbell – I’m such a big Campbell fan that I originally had him in the field. But after taking a closer look at the numbers I realized that he was not elite for long enough. His first four years were spectacular, but he simply burnt out too quickly. Over an entire career he actually falls short of Eric Dickerson. So there it is, I’m sure there are a few dozen others that can be argued onto this list, and that’s what the comments section below is for. In the next few days we will start going over the brackets for the Ultimate Franchise Player tourney and continue our quest for the greatest pro football player ever. GmTpHd Superb post here, thought I could learn more from but we can learn more from this post. For most up-to-date news you have to pay a quick visit world-wide-web and on internet I found this web page as a finest web page for latest updates. i0uIff I value the article.Much thanks again. Really Great. DnSjGC When some one searches for his necessary thing, therefore he/she needs to be available that in detail, thus that thing is maintained over here. I am in fact grateful to the owner of this web site who has shared this fantastic piece of writing at at this place. basis. It’s always useful to read through articles from other authors and practice something from other sites. Such a deep answer! Your article has proven super useful to me. clearness on your post is simply excellent and i could think you’re knowledgeable in this subject. Thank you for any other fantastic post. Where else may just anyone get that type of info in such a perfect way of writing? something that makes people want more? I mean NFL Ultimate Franchise Player Tourney field unveiled!! presentation however I to find this matter to be really one thing that I think I might by no means understand. Really Cool! The people you love are lucky to have you in their lives. Thank you! Your perspective is super refreshing. I pay a quick visit every day a few websites and websites to read articles, but this weblog gives feature based articles. I will immediately seize your rss feed as I can’t find your e-mail subscription link or newsletter service. Hiya very cool website!! Guy .. Excellent .. Amazing .. I’ll bookmark your website and take the feeds also? Found this on Tumblr and I am happy I did I have been surfing on-line more than 3 hours today. Somehow you make time stop and fly at the same time. A great article. I am going to follow you on Pinterest. I could not stop myself from commenting. Thanks for the advice! Yes! Finally something about business plan. It is rare to see a nice blog like this one these days. I love mass roots but I’ve always been a supporter of marketing consultants. Old school Instagram pros would agree with you. Needed to post you the very little word so as to thank you the moment again for all the pleasing solutions you’ve discussed on this site. It was simply unbelievably generous with people like you to grant extensively just what numerous people might have supplied for an ebook in order to make some profit on their own, most importantly now that you could have done it if you wanted. The principles also served to become a easy way to be sure that other people online have the same dream like mine to find out more with regards to this problem. I believe there are several more pleasant instances ahead for many who go through your website. I wish to show my thanks to you just for rescuing me from this situation. Just after surfing throughout the world wide web and getting things that were not pleasant, I thought my entire life was gone. Living without the presence of strategies to the problems you have sorted out through your guideline is a serious case, as well as ones which could have in a wrong way affected my career if I had not noticed your site. Your skills and kindness in playing with almost everything was excellent. I am not sure what I would have done if I had not come upon such a thing like this. I can also at this moment relish my future. Thanks for your time so much for this skilled and results-oriented help. I won’t hesitate to recommend the website to any individual who requires support on this matter. I not to mention my friends were looking at the great pointers from your web blog while unexpectedly got an awful feeling I had not expressed respect to you for those strategies. All of the boys became so passionate to read all of them and already have simply been taking advantage of those things. I appreciate you for being quite considerate and also for making a choice on some superb guides millions of individuals are really desperate to be aware of. Our own honest apologies for not expressing appreciation to you sooner. I am only writing to let you be aware of of the useful discovery our girl had reading your webblog. She mastered too many things, with the inclusion of how it is like to possess a great coaching mindset to make the mediocre ones completely gain knowledge of several multifaceted subject areas. You undoubtedly exceeded people’s desires. Thanks for churning out those practical, safe, educational and unique tips on your topic to Gloria. Thank you so much for giving everyone remarkably nice chance to read from this blog. It can be so ideal and as well , stuffed with a great time for me and my office mates to search the blog the equivalent of thrice a week to read through the latest secrets you have got. And lastly, we’re usually contented considering the fabulous opinions you give. Certain 4 points in this posting are in truth the best we’ve ever had. Thanks a lot for providing individuals with an exceptionally marvellous possiblity to read articles and blog posts from this web site. It is often very ideal and full of amusement for me and my office acquaintances to visit your site nearly thrice weekly to find out the new guides you have. Not to mention, I am just usually contented for the very good strategies you serve. Selected two tips in this article are undoubtedly the most suitable we have had. I must express appreciation to this writer for rescuing me from such a problem. Just after surfing around through the internet and coming across tricks that were not powerful, I thought my life was well over. Living minus the answers to the problems you have fixed as a result of your article content is a critical case, and the kind that might have badly affected my career if I had not noticed your web blog. Your personal mastery and kindness in maneuvering everything was precious. I am not sure what I would have done if I had not come upon such a point like this. I can also at this moment look forward to my future. Thanks a lot very much for this expert and results-oriented guide. I will not think twice to endorse your web blog to anyone who would like tips on this problem. I wanted to send you that bit of observation to finally thank you so much as before for all the magnificent tips you have featured above. It is really seriously generous of you to deliver extensively what exactly a few people would’ve offered for sale for an electronic book to help with making some cash on their own, and in particular now that you might have done it in case you decided. These advice as well worked to be the great way to be certain that other people online have similar interest much like mine to grasp a lot more on the topic of this issue. I know there are many more pleasurable opportunities up front for many who take a look at your site. first among the automatic selections, and then overall. We are a group of volunteers and opening a new scheme in our community. Your web site provided us with valuable info to work on cheap nfl jerseys china. You have done an impressive job and our entire community will be thankful to you.